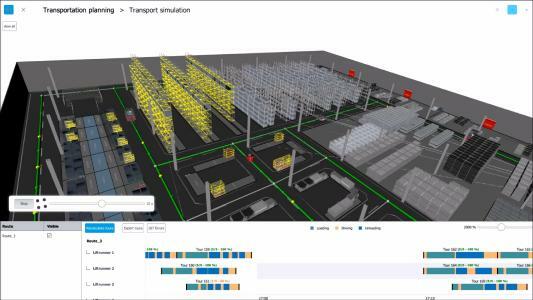 Latest version of the 4D planning software IPO.Log offers integrated planning of the material flow from goods receipt to the finished product from logistics and assembly point of view and enables a new form of planning with cost optimisation. Leonberg, 23.02.2018 (PresseBox) – When a new production line is planned or new products are to be integrated into the existing production line, it quickly becomes unmanageable and complex. Different systems, areas and questions have to come together at the end for an optimal production. A large number of meetings, change rounds, revisions and various datasets lead to loss of information and can cause collisions in the implementation. The planning of logistics processes in particular depends on many factors and can only be planned efficiently and correctly in a holistic context. IPO.Plan offers a solution for these requirements: The planning software IPO.Log makes the entire material flow from goods receipt to the finished product in 3D interactive planning possible. This digital twin forms the basis for efficient and accurate material flow planning. The 3D model allows the planner to identify correlations and potentials from the goods receipt to the assembly line and leads to the best result. Effects of changes become visible here, so that the input can be evaluated at any time and the result can be implemented 1:1 in reality. In IPO.Log, logistics and assembly are planned and optimized coherently. This allows you to interactively optimize very complex planning dependencies. The common view of planning across department boundaries shows optimization possibilities after a few clicks, which have been difficult to find out since then. The intralogistics sector in particular is usually only adapted manually to the current production situation. With IPO.Log, this can be done efficiently in both strategic and operational planning. The software combines the advantages of CAD, virtual reality and automatic simulation. Route schedules as well as the capacity utilization of AGVs and forklifts are adapted to the current order situation or the production programm on site and are presented in an easily understandable and clear way. The focus is also on planning supermarkets, picking areas and warehouses. Trade fair note: IPO.Plan presents the new version to the public at the LogiMAT trade fair from 13 to 15 March in Stuttgart. Visit the booth in hall 1 at booth 1F31.